Mucoepidermoid carcinoma (MEC) is a relatively common salivary tumor with varying potential for aggressive behavior. 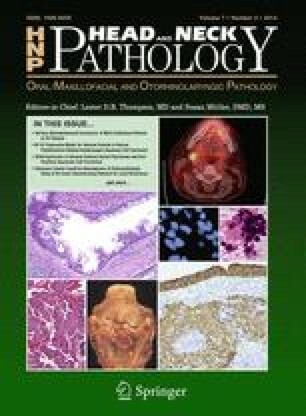 Mucoepidermoid carcinoma grading has evolved from descriptive two-tiered schemata to more objective three-tiered systems. In 2001, we published a grading system Brandwein et al. in Am J Surg Pathol 25:835–845, (2001) which modified the prevailing criteria of Auclair et al. in Cancer 69:2021–2030 (1992), and included additional features of aggressive MEC. Here we seek to validate our modified grading system in a new multicenter cohort. The retrospective cohort consisted of 76 patients with confirmed MEC and known outcome data. The resection specimens were reviewed and uniformly graded according to our modified criteria Brandwein et al. in Am J Surg Pathol 25:835–845 (2001), and the Auclair criteria Auclair et al. in Cancer 69:2021–2030, (1992), Goode et al. in Cancer 82:1217–1224, (1998). Case distribution was as follows: Montefiore Medical Center: 41 (1977–2009), University of Alabama at Birmingham: 21 (1999–2010), and Rhode Island Hospital: 14, (1995–2011). Patient age ranged from 7 to 81 years (mean 51 years). The female to male ratio was 3:1. The most commonly involved sites were: parotid: n = 39 (51 %), palate: n = 10 (13 %), retromolar trigone: n = 6 (8 %), buccal: n = 5 (7 %), and submandibular gland: n = 5 (7 %). The modified criteria upgraded 41 % MEC; 20/25 MEC from AFIP Grade 1 to Grade 2 and 5/25 from AFIP Grade 1 to Grade 3. Eleven patients had positive lymph nodes; the AFIP MEC grade for cases were: Grade 1–3/11, Grade 2–1/11, and Grade 3–7/11; the modified grading criteria distribution for these cases were Grade 1: 0/11, Grade 2: 1/11, and Grade 3: 10/11. Nine patients developed disease progression after definitive treatment. High-stage and positive lymph node status were significantly associated with disease progression (p = 0.0003 and p < 0.0001, respectively). For the nine patients with disease progression, the modified grading schema classified eight MEC as Grade 3 and one as Grade 2. By comparison, the AFIP grading schema classified three of these MEC as Grade 1, and the remaining six as Grade 3. Despite the fact that this multicenter retrospective study accrued 76 patients with outcome, the predictive performance of the two grading schema could not be compared due to the few patients who experienced disease progression and were also reclassified with respect to grade (n = 3).